Whenever I have guest over from out of town (including friends and family who use to live in Michigan) I like to send them back with a “made in Michigan” goody. Since the warmer months tend to bring a lot of out of town guests to my house I figured June would be the perfect month for a made in Michigan friendship gift. 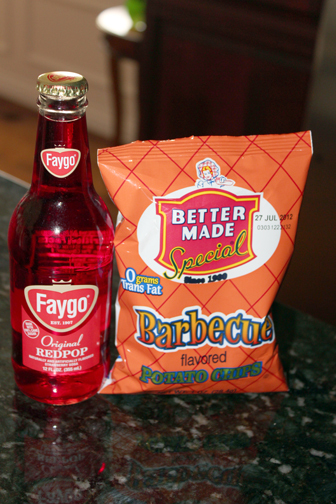 Guests will have their choice of: Faygo pop in old fashion bottles or a bag of Better Made Barbeque potato chips, both are made in Detroit, and equally delicious. I just love all of your ideas! This one is perfect for summer. cute idea! we're having a party this weekend for my little chicklet and I will definitely do this since so many people are coming from out of state!! 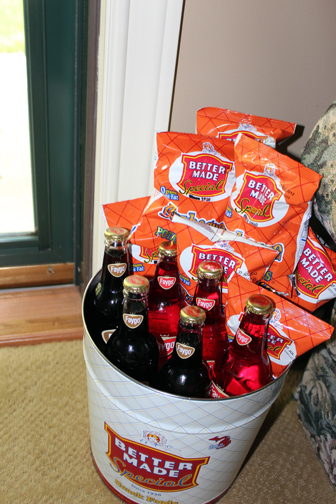 What a fun and thoughtful idea! This is awesome! such a cute idea. I need to start doing that. you are a sweetheart for having michigan gifts in your household. i would love to try those chips. oh speaking of which i will be in michigan next week! 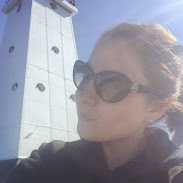 I stumbled on your blog today, and I'm happy to have found it! That looks awesome - I've never had either of these. Faygo...I definitely remember that from when I was little.